For this summer, let's prepare this delicious salad, which is both tasty and colourful !! (To make a vinaigrette, mix 2 soup spoons of vinegar with a teaspoon of mustard and 4-5 soup spoons of oil, add salt and pepper). Cook the rice, cool down (with cold water) and drain it. Cut the onion in slices, the tomatoes in 4, the bell pepper and the pineapple in dices. Bring together the rice, the drained kidney beans and corn, the pineapple and the bell pepper. 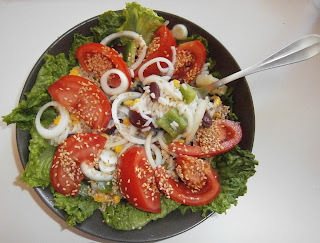 On the plates, put lettuce, then the rice salad. Decorate with tomatoes and onion slices. Sprinkle with sesame seeds.